With the current design, the information that can be found on the main brigade screen or in the "communications" tab, is limited, unclear or not very useful. Furthermore you can no longer access some needed information once you joined a mission. The new design tries to give more useful information to brigade members and leaders, makes it available everywhere it's needed, and tries to make coordination and organization much easier thanks to this. Many features contained in the next sreenshot have already been introduced in previous topics. #51. The same list of active missions ordered by category then the one that can be found in the side HQ (topic 1.1) is displayed on the left of the screen. #54. Current AO(s) status are displayed, showing for how long they have been active. #57. A mission display filter allows to find a specific mission in the list. #58. A part of the screen now displays all units that don't belong to this brigade (ground, air, naval), but which are currently also involved in the same areas (home town and target). It would actually just gather missions filtered when selecting the towns on map in the side HQ (feature #29). Selecting one of these platoons would also display its details on the map and on the left. This becomes valid for squad mission as well, in opposition to the side HQ level where you read squad informations instead. Note that mercenaries are not taken into account. This important feature would allow brigade members and leaders to get an excellent situational awareness of available troops, allow easier coordination with air/naval units and other ground forces, and allow players to more easily know if there's another more pertinent brigade to join then the one they're currently in. #59. 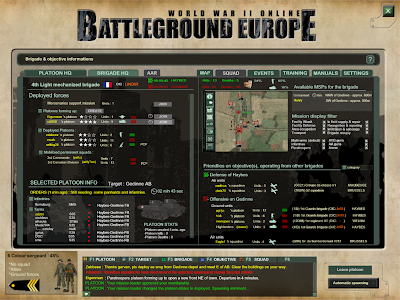 In the chat window you'll notice notifications about the membership candidature being approved by the leader (feature #46), and a change of the platoon status which means an automatic spawn signal is imminent (feature #48). #60. When leaving the platoon thanks to the "leave platoon icon", you would land in the brigade HQ and be allowed to join another mission. Note : Some feedbacks pointed out that the information displayed in this screen is very useful, but is a bit too much because of spying issues. Therefore, some of the information could eventually be filtered and displayed only for MLs and OICs. Is there a way to incorporate the status of Axis/enemy supply status based on rough info? Incorporate KFS1 info as well? I like it too but I'm still concerned about the information that can be exploited by spies. Maybe don't share that much details. It could also be interesting to get a K/D ratio of all involved forces on an AO.